I have a problem with corners curling on my throw rugs and I think this will help. Couldn't find them in local stores. So the runner on the hallway won’t move out of the place when we walk on it. I have a rug in the kitchen on wood floor that keeps slipping even though I put rug tape on the bottom to keep it from slipping. I hope these corner rug grips will keep it in place. 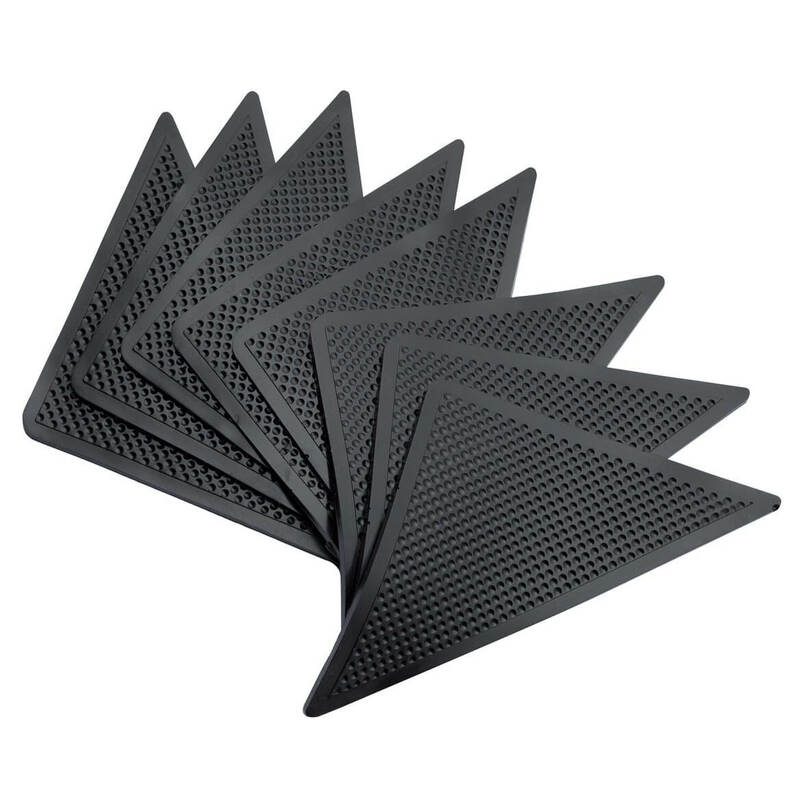 Have a kitchen runner rug that keeps slipping or curling up - will try these to provide safety feature to prevent tripping. For a hallway rug that keeps moving and afraid someone may trip. Hard to find something that will hold a throw rug down on carpet. there is a new throw rug that has to be put down and need these items. I have a rug that needs to "stay-put"
The corner of my rug lifts which creates a trip hazard. I hope this will keep that corner down. I need these to keep my carpet runner in place. Hope they work! I have 3 area rugs on carpeting that keep bunching up. I tried the sticky, plastic, pad underlay but it doesn't allow me to remove the rugs for cleaning without leaving a residue on my carpeting and having to buy a new underlay. These look promising; I hope they work! I have a rug that refuses to stay put. I hope these work! Appears to be a nice clean, quick fix to any carpet. Curling corners on area rugs can be dangerous as well as merely unsightly. These little wonders are much easier to deal with than the sheets of non-slip material you have to cut to size and then futz with every time you move the rugs. I have not been able to find these anywhere else. I have rugs that need them. So my bed rugs will not slide when I get up. I have a couple of lage mats. Perfect for my needs. I have a throw rug that moves a lot so these keep it in place and they are so easy to stick on the corners of your rug. so my carpets don't move around and stay in place. These will help to keep my rugs in place. I had a rug in living room that the corners kept rolling up, since i had hip surgery i have to be careful not to fall. This helped out alot. The mat I have under my chair in my office keeps moving. I am hoping with the grippers, the mat will stay put which means the chair will remain in the right place. These did not work well on my floors. I have laminate and they didn't stay in place at all. Wouldn't buy again. 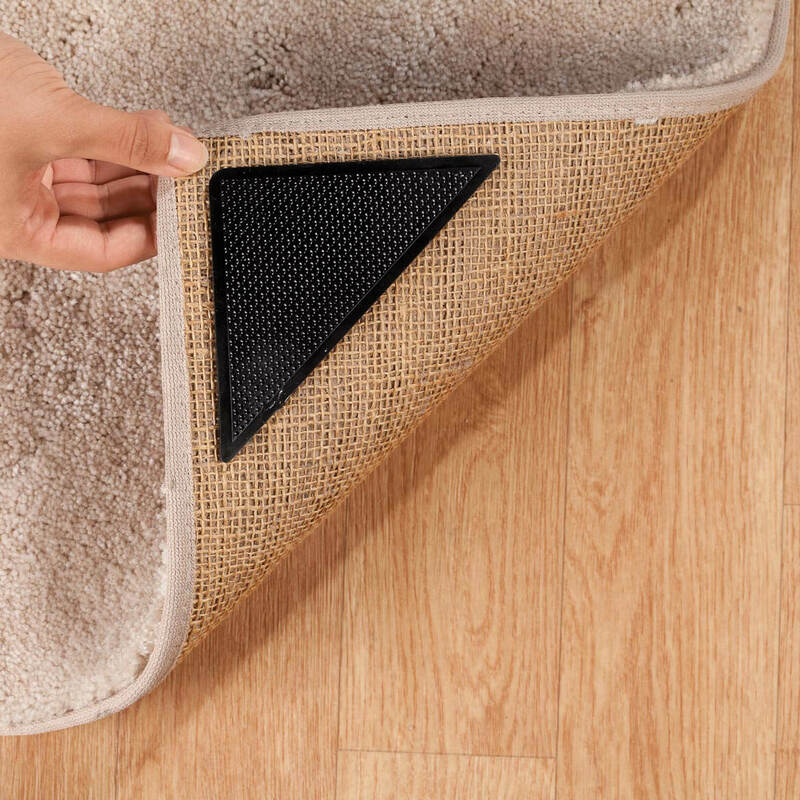 to anchor a rug that is on top of carpet. to keep my rug from slipping from under my feet. I think I will like this better than the rubber sheeting that goes under the whole rug. Hope, will help keep accent rugs in place. Just bought some new rugs and need these. I hope they work! I don't get out to shop and I think they would be hard to find in stores. I am 84 and they will save me from work and maybe a fall. can I use these on a rug that goes over carpet? BEST ANSWER: Thank you for your question. Yes, you can use them on a rug on carpet. We hope this information will be of help to you.